The Great Smoky Mountains Association has shared some information on upcoming hikes and other outdoor activities. Sunday, September 2, 2018, 9:00 a.m. Alum Cave Trail–Great Smoky Mountains National Park, Tennessee. When you hike Alum Cave Trail, you’ll travel the park’s latest Trails Forever success story. What was once a worn path is now a safer, smoother trip along one of the most scenic trails in the Smokies. Join professional guide Liz Domingue to explore the beauty of this trail. The hike is 5 miles and is rated moderate to strenuous. Saturday, September 22, 2018, 8:30 a.m. Swain County Visitor Center and Museum, Bryson City, North Carolina. History in the Noland Creek Valley runs deep. During the late 1800s and into the early 19002 this remote area was home to farmers and their families. In 1905 the Harris-Woodbury Lumber Company purchased 17,000 acres but spared the Noland watershed from logging operations. Surrounded by natural beauty, Steve Kemp, award-winning author and Smokies historian, will interpret the history and uses of the area. The hike is about 12 miles and is rated moderate to strenuous due to the length. Monarch butterfly tagging programs are available on 3 dates in the Cades Cove area. held at 9:00 a.m. on Saturday, September 22, Sunday, September 30, and Saturday, October 6, 2018. 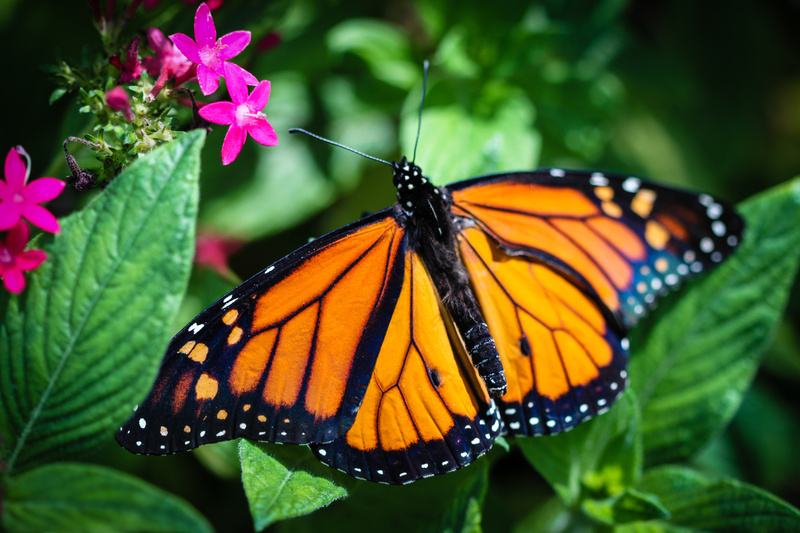 Monarchs are the only known butterfly species to make a true migration in North America. Many of the monarchs we see traveling through East Tennessee are on a 2,000 mile journey to spend winter among forests high in the mountains of Mexico. The Great Smoky Mountains Association monarch tagging program gets you involved by collecting data that will help scientists answer questions about the origins of monarchs that reach Mexico, the timing and pace of the migration, mortality during the migration, and changes in geographic distribution. Plan on 3 miles of hiking that is rated easy. For more information on these, and other, activities, please visit the Great Smoky Mountains Association at http://www.smokiesinformation.org. Guest Reviews Make our Day! It Can’t Get Much Better!! We had a wonderful get-a-way with expected awesome meals and unexpected warm, sunny weather (included great views of Mt. LeConte from our room). We had only eaten there previously not stayed the night. Very quite atmosphere, great hosts and staff, dinner of course was exquisite as was breakfast. We will be back! Room Tip: All rooms are shown on website. Don’t miss selection one with a view of Mt. LeConte. The Buckhorn prides itself in leaving no stone unturned–no detail overlooked—this visit was no exception—every “t” was crossed and every “i” dotted!!! This was our first stay in a guest home—The Webb Mountain House–and it was spectacular—appointed wonderfully–excellent views–breakfast was beyond compare and dinner was beyond any of our expectations—so delicious!! Erica made sure our every need was cared for!! Lee and Debbie are the best hostesses around! When you think The Smokies–or Gatlinburg–Look no further than a stay at The Buckhorn Inn!! You will be thrilled you did! Once you stay at the Buckhorn Inn, you will want to return again and again. Buckhorn offers spectacular views of Mt. LeConte. You have a choice of accommodations, including rooms in the inn itself, private cottages (our favorite) and even private guesthouses. All of the rooms are tastefully decorated and comfortable. The four course gourmet dinners are the highlights of our stays. The grounds include a Nature Trail for walking and plenty of beautiful spots for relaxing. Plus the inn is located within the Gatlinburg arts district featuring galleries, craftsmen and shops. My husband and I have been visiting Buckhorn for about 15 years now, and we can’t wait to go back. The Buckhorn Inn features many cozy spots. Thank you everyone for these wonderful reviews. We strive to make your stay with us lovely in every way–thank you for letting us know we are hitting the mark!